San Francisco is one step closer to opening safe injection sites after the bill that would allow facilities for people to use controlled substances in a safe setting was cleared Tuesday. San Francisco is almost set to allow a pilot a program to let people inject heroin and other drugs under medical supervision in an effort to curb overdose deaths. The California Assembly voted 41-24 Monday to send Gov. Jerry Brown a bill allowing San Francisco to operate so-called safe injection sites where the city would provide sterile needles and people would be able to use illegal drugs there without fear of arrest. Click to see NBC Bay Area's report on the supervised injection sites in Vancouver, Canada. San Francisco Mayor London Breed said she supports the bill and that the site will save lives. San Francisco is preparing to open two safe injection sites this summer in hopes of getting a handle on rampant drug use and cutting down on the spread of disease. Sam Brock reports. "We are in a public health crisis and this bill will help us by preventing overdoses while connecting people to medical care that can help treat their addiction," Breed said in a statement. On Wednesday, Breed is set to visit a full-scale model of a safe injection site at the Glide Foundation in the city's Tenderloin neighborhood. 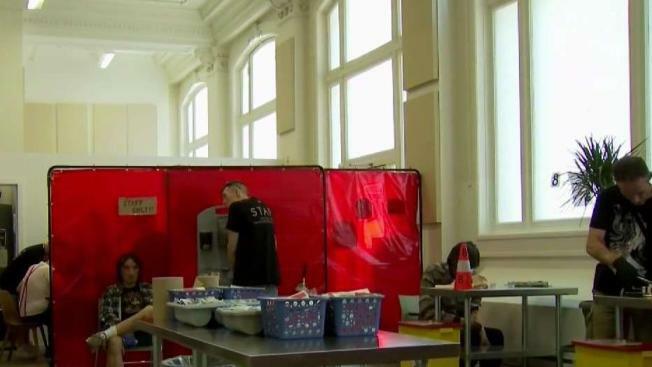 The model, called Safer Inside, is equipped with supervised injection booths, medical equipment, trained staff and a clinical area that provides users with access to health care and harm reduction services. But an opponent, Assemblywoman Melissa Melendez of Lake Elsinore, said she worries it will encourage prolonged drug use.